Another improvement is brought by Google to users in its web based photo management software application, Google Picasa. Besides photo editing, slide show presentation, printing, etc, Picasa web album users will now enjoy another new face recognition feature. It is a cool feature which allows users to organize their photo collection by people. The feature is smart enough to recognize similar faces or features in users’ photo collections and allows them to tag those photos. Using Picasa’s “name tag” feature also helps users to work with their photos more effectively. With this feature, instead of painstakingly labeling photos one-by-one, users can save time and tag many photos all at once. For instance, with this “name tag” label in place, users can easily call out all their husband or wife’s photos, compile these photos in a slideshow or an album and share with others. Let’s take a look at this video clip at how the name tag feature works. This “name tag” feature is based on the innovation by Neven Vision. 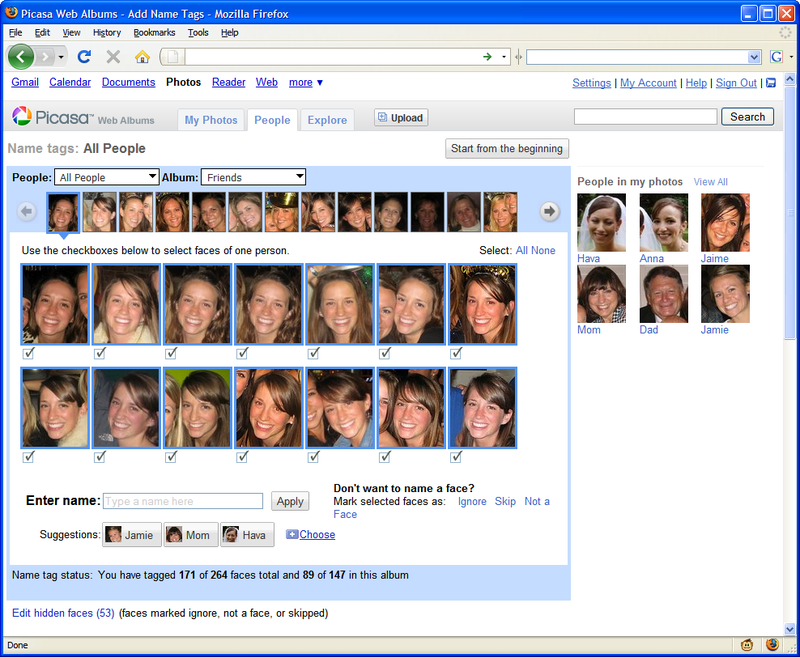 Neven Vision specializes in image recognition software and was bought over by Google in 2006. Neven Vision is backed by Anthem Ventures, Zone Ventures, Third Wave Ventures, and NTEC. Picasa is another Southern California acquisition of Google’s, and was bought over from Pasadena-based Idealab in 2004. Labeling or tagging is an effective way to sort our database. It will expedite the data search process if the database is labeled or tagged effectively. With this new tagging technology, Picasa users will surely have more fun while managing their photo collections. They can slice and dice their photo collection to show particular people, activities, or locations. In the long run, this new feature will likely boost the popularity of the web based album.